Two SUVs intercepted Valentín Valdés Espinosa’s car in downtown Saltillo, Mexico. Gun-wielding thugs forced the 29-year-old general assignment reporter into a vehicle. It was shortly before midnight on Jan. 7, 2010. In the preceding days, Valdés Espinosa had aggressively reported the arrest of several drug traffickers in the northern Mexico city — and had committed the cardinal sin of identifying them by name — for his newspaper, the Zócalo de Saltillo. In another article, Valdés Espinosa had identified a policeman arrested for being on the drug traffickers’ payroll. Local authorities seemed to get the message. They have barely investigated the case, failing even to search the journalist’s computer. Since then, another eight Mexican journalists have been murdered and another eight have been kidnapped and remain missing for a total of 17 dead and missing for the year. None of their cases have been solved in a country where warring drug traffickers have killed each other in battles over territory, have murdered policemen and politicians and have engaged in bloody shootouts with government troops sent to restore order. In just the past five years, drug-related violence has claimed the lives of tens of thousands of Mexican citizens and an estimated 61 journalists. Intimidated, and for good reason, many newspapers throughout Mexico have stopped reporting on drug violence except for publishing official press releases. Newspapers and TV stations in Ciudad Juárez and other cities on the U.S. border have fully withdrawn. They simply no longer report drug shootouts that leave police, drug traffickers and ordinary citizens dead in the streets. They publish some stories demanded by the narcos, as they are called in Spanish. “We’re in the middle of an undeclared war,” says Roberto Rock, who served as editor of the Mexico City daily El Universal. This point was underscored when a photographer for El Diario de Juárez was shot dead on Sept. 16, and an intern was seriously wounded, while they were heading out to eat lunch. El Diario — the biggest newspaper in Mexico’s most violent city — took the extraordinary step of publishing a front-page editorial three days later that asked drug cartels to explain what information the newspaper should not print to avoid more attacks. Project Against Impunity by the numbers: Journalists murdered, missing or presumed dead, 1995 through August 2010. Source: Inter-American Commission on Human Rights. Facing the worst wave of violence against journalists ever in Latin America, the Miami-based Inter American Press Association has stepped up its efforts in Mexico by investigating the facts in murders, organizing seminars on how reporters can better protect themselves and issuing resolutions by its 1,061 members that condemn the killings and demand justice. The IAPA has sent two high-level delegations to Mexico in 2010, with the second delegation holding a lengthy meeting with President Felipe Calderon on Sept. 22 at which he promised to push Congress to federalize crimes against freedom of expression. But with the reversals in Mexico and a worrisome murder spike in Honduras offsetting the gains in Colombia, Brazil and other countries — and journalists elsewhere in Latin America still getting killed or facing death threats — the gnawing question remains: How can IAPA better protect journalists in the region? It is not an idle question. Since 1995, the John S. and James L. Knight Foundation has financed an IAPA campaign to provide justice for those slain on the job and to protect reporters on dangerous assignments. Called the Impunity Project, the campaign includes all Latin American countries but focuses on those hit hardest by the violence against journalists: Mexico, Colombia and Brazil. The project has received a total of $7.6 million, including $2.5 million over the past four years. Murders by country: Although Colombia and Mexico registered nearly the same number of murders of journalists between 1995 and 2010, the majority of cases in Mexico occurred within the last six years (2005-2010) while Colombia registered fewer cases during the same period. 1995 through August 2010 * In Mexico, 19 of the 89 are missing. The organization has clearly moved the needle on perhaps the most important measure: Not all killers of journalists go scot-free anymore. The IAPA’s missions and persistent efforts have put the impunity problem on the agenda of many government leaders throughout the region and of international groups such as UNESCO. Several key countries have toughened laws for the murder of journalists and are actively carrying out investigations and prosecutions, although rarely consistently. Journalists in Colombia and Brazil are no longer getting mowed down. Despite the improvements, the bottom line for Latin America remains distressing: most killers of journalists still face little likelihood of jail time. Prosecutors have won convictions in only 59 of the 258 killings and presumed killings of journalists in Latin America since 1995. To put the situation into context, however, it’s important to note that impunity reigns across the board in a region where justice is more of an ideal than a reality. The IAPA can lessen impunity only where its chief tools — investigating killings, issuing resolutions and meeting with political leaders face to face — inspire a government to act. When lawlessness reigns, as it did in Colombia during the 1980s and 1990s and in Mexico today, the IAPA faces nearly insurmountable odds in trying to ensure justice for murdered journalists. The IAPA’s Rapid Response Units in Mexico, Colombia and Brazil — consisting of one journalist per country — have provided the foundation for the group’s work. They have fleshed out the facts in murder after murder to publicize the crimes immediately afterward and to provide the documentation needed to press for investigations and arrests in old cases seemingly forgotten by authorities. When authorities will not advance a case any further, the IAPA sends it to the Inter-American Commission on Human Rights. Justice, if it comes at all, is slow, and governments might ignore its rulings, although they do carry a strong moral imperative. In two cases, the Washington, D.C.-based commission won reparations for the families of a victim in Brazil and another in Guatemala. Making Progress Against Impunity: Since 1995, when the Project Against Impunity started, 126 killers of journalists have been convicted (the previous 10 years saw only five convictions). Still, those killers, many of them accomplices in the same murder, were held responsible in only 59 of the 258 journaled murders that have occurred in Latin America since 1995. Further, the years since 2008 have seen an alarming spike in murders. Because prosecutions can take years, it remains to be seen whether convictions will also rise. * Murdered, or missing and presumed dead. Source: Inter American Press Association. Note: Date represented through August 2010. The IAPA has fallen far short of its stated goal of making impunity “everybody’s problem.” The group seems to have raised awareness about the issue in at least some countries — particularly in Colombia and Brazil — but even its supporters acknowledge that the general public does not equate killing a journalist with tearing at the fabric of democracy and civil society. Newspaper editors and owners throughout the region seem to view the Impunity Project as a necessary — albeit imperfect — tool. Reporters on the front lines, though, say the project does little to make them feel safer. The disappearance of the IAPA’s project would create a void that seems difficult to fill. Other groups are now pressing the case against impunity, but none has the overarching presence or clout of the IAPA, which has members in 33 countries in the Americas. The IAPA, however, should put more emphasis on preventing murders through increased training programs for reporters in risky areas throughout the region and by treating Mexico as an emergency demanding even more time, attention and money, says Robert Rivard, editor of the San Antonio Express-News, who has made repeated trips to Mexico with the IAPA. More is at stake in Mexico than simply journalists’ lives. The drug traffickers have extended their tentacles so deeply into all levels of Mexican society that what’s happening there has gone beyond a drug war to begin to threaten the functioning of civil government, in ways hauntingly reminiscent to the terrible times that Colombia suffered. With the press silenced in so many cities, especially in the north, Mexicans are not getting basic information about a fundamental threat to their democracy: how the drug traffickers have corrupted mayors, governors, judges, prosecutors and the police. It will be difficult for Mexicans to take back their country without the press spotlighting what has gone wrong and highlighting what needs to be done. All too often, journalists in Latin America have to work in combat zones. In 2009, the death toll for journalists hit a record 25, the IAPA reports. The toll reached 26 during the first eight months of 2010, a figure that includes eight kidnapped journalists in Mexico who are presumed dead. In contrast, just one journalist has been gunned down in the United States in the past 35 years, and one each in Uruguay and the Dominican Republic over the past 15 years. But throughout most of Latin America, killers know that, for the most part, they can kill without fear of punishment. Against this backdrop, the Impunity Project began with a simple question: “How can we make a difference”? It was 1994, and David Lawrence, the publisher of The Miami Herald, was beginning a one-year term as the IAPA’s president. He was discussing the impunity problem with Julio Muñoz, the IAPA’s executive director, and Ricardo Trotti, the IAPA’s freedom of the press coordinator. One thing led to another, and soon a team was dispatched to investigate six murders in Latin America and publicize the facts to try to goad authorities to act. The project was created a year later with Knight Foundation financing. Trotti, a 52-year-old journalist from Argentina, has been the prime mover from its inception. Simon favors the second definition, and he makes a good argument. The actions of governments, the brutality of drug cartels and the attentiveness of newspaper editors and owners have far more say in determining whether journalists live or die than does the Impunity Project. Given that the IAPA’s influence is limited, here’s a key statistic to help determine the project’s impact: Only five killers of journalists had been convicted of their crimes in the 10 years before the project began in 1995, according to the group. Since then: 126. The project has been a resounding success under that measure, but the numbers do overstate the case. The 126 convicted killers, some of them accomplices in the same case, were held responsible in only 59 of the 258 killings and presumed killings of Latin America journalists since 1995. So impunity still reigns in most killings. And many killers have gone to prison only briefly. Another key statistic: of the 258 murders of journalists since 1995, only six masterminds have been convicted, though prosecutions have risen from none in 1995 to 12 last year. Another measurement shows the IAPA’s impact: three countries (Guatemala, Mexico and Colombia) have approved laws creating special offices to prosecute journalists’ killers or toughening punishment for their crimes. But this achievement has been less potent than the IAPA had hoped. The IAPA helped prompt the Colombian government to create a special prosecutor’s office that is sending more killers of journalists to prison. “Police are doing a better job of investigating,” says Fernando López, one of the special prosecutors. “We’re getting more help from witnesses.” López says his office would have more success with more money and wondered whether Knight Foundation might write a check to lend a hand. In Mexico, IAPA leaders helped pressure the government in 2006 to create an office to prosecute crimes against journalists. But the prosecutor made little progress. The IAPA began complaining again, and the federal government in March named a new prosecutor. But he remains short of money and staff and is so cowed that he insisted that an interview in August be entirely off the record. “You can have all the good laws in the world, but that doesn’t matter if you don’t have political will and follow-through,” says Mexican Congressman Manuel Clouthier, who has been pushing without success a measure that would take murders of journalists from local prosecutors — who too often do cursory investigations — and turn them over to federal authorities. Beyond pushing for justice, the IAPA has tried to strengthen political will to protect reporters throughout the region. In 2003, the project began an advertising campaign that once a month has publicized the unsolved murder of a Latin American journalist. The ads, supposed to run in IAPA member newspapers throughout the region, have asked readers to sign petitions calling for justice that the IAPA would forward to the appropriate government. The campaign has aimed to engage readers in the problem and put pressure on governments. Total in-kind contributions by IAPA members of ad space since 2003 exceeds $28 million, Trotti estimates. About 270 of the group’s 1,030 newspaper members run the ads monthly, down from 320 newspapers in 2007, according to an informal IAPA survey conducted for this report. And the campaign has been averaging only 265 signatures per month this year, according to the IAPA. Trotti thinks the ads remain effective even if members are “not being as consistent’’ in running them. The ads focus public attention on forgotten murders, make governments “uncomfortable’’ and generate publicity, he said. But the campaign would be “much better’’ if it also used digital and social media to stir public action, he said. Trotti also understands that the IAPA needs to improve its drab and outdated website, www.impunidad.com which could be used to humanize the journalist murders in Latin America and stir outrage — but doesn’t. With that in mind, the IAPA has hired a consulting firm to help the group upgrade its website and shift its focus to more online activities. IAPA hopes the new strategy will help the group reach its projected target of 50,000 unique visitors per month — up from 20,000 currently. Diana Calderón is on the phone with Trotti in Miami. Calderón, 42, serves as the IAPA’s Rapid Response Unit in Colombia. The units were created in 2000 following a conversation between Trotti and Alberto Ibargüen, then The Miami Herald’s publisher and chairman of the IAPA’s Impunity Committee. He is now Knight Foundation’s president and chief executive officer. Over the past decade, Calderón has documented the facts in scores of unsolved murders and quickly alerted Trotti of each new journalist attack. On this day in early August, Calderón is providing the details on the latest apparent target — the offices of Radio Caracol in Bogota, where she works. A car bomb exploded at 5:30 that morning, injuring 13 people and damaging the building’s facade. Calderón is camped out in a colleague’s office. Her seventh floor windows are blown out. Trotti takes down her information and will write a news release calling for an aggressive investigation by the Colombian government. He will send it to all member newspapers and the wire services. This type of work is central to the Impunity Project’s work in Colombia. The group has also pushed Colombian judges to give higher priority to cases of murdered journalists, gotten the prosecutor’s office to review 27 unsolved cases, undertaken an advertising campaign to create greater public awareness and produced a documentary on a slain journalist that was broadcast on prime time television. The journalist was Orlando Sierra. His assassin was captured and convicted but was released after only five years in prison thanks to an early-release program. The IAPA and Andiarios, which represents Colombia’s newspapers, hired two lawyers to produce a report on the Sierra case and have used the information to push Congress to impose minimum sentences with longer terms. Congress has been unmoved. The good news is that violence against journalists has almost disappeared in Colombia. Seven journalists were killed per year on average from 1998 thru 2003 while doing their job, according to the IAPA. But only one journalist was murdered in 2009 and thankfully only one (Clodomiro Castilla Ospino in the provincial city of Monteria) met that fate through August in 2010. The IAPA’s efforts have clearly had an impact, as have the efforts of local groups that have joined the IAPA in working against impunity. But when asked why murders of journalists have plummeted, Sanín says: “The major reason is the government’s policies.” During the eight years that Álvaro Uribe served as president and waged war against violence, killings in Colombia dropped across the board. And while there have been advances, Colombia’s judicial system still falls short. The case of Nelson Carvajal exemplifies this, despite the IAPA’s best efforts. Carvajal, a 37-year-old radio journalist in the provincial town of Pitalito, was shot seven times and died in 1998 after denouncing local corruption on the air. His family pressed authorities for action. That’s when the phone calls began. If the family knew what was good for them, callers said, they would lay off the case, or else end up like Nelson. They didn’t lay off. Authorities imprisoned four men, including the alleged mastermind. But all were acquitted and released. Calderón took up the case in 2002. She made three trips to Pitalito to interview witnesses, gather facts and review the court record. Thanks to her efforts, authorities reopened the case. The death threats against Carvajal’s family resumed. One of his sisters escaped an attempt on her life. With the IAPA’s help, she entered a government witness protection program. Carvajal’s widow and other members of the family fled the country, with the Colombian government’s help. In 2006, it was Calderón’s turn. “Keep on investigating, and you, too, will earn your final resting place,” read a note sent to her office that included crosses meant to evoke graves. The government assigned her bodyguards full-time. The IAPA didn’t lay off the case. Beginning in December 2005, Ricardo Trotti held seven meetings with the Colombian government, accompanied by Enrique Santos, who was then the IAPA’s vice president and publisher of El Tiempo, the Bogota daily newspaper. “Diana constantly pressured the prosecutors,” says Miriam Carvajal, as she sits in a Bogota café and discusses her brother’s murder. “The prosecutor’s office moved the case forward because of the IAPA.” That investigation has had limited success, however. The Supreme Court rejected a request to review the case. Trotti takes great pride in sending unresolved cases to the Inter-American Commission, which is part of the Organization of American States. Gonzalo Marroquín, owner of Prensa Libre, the Guatemala City daily newspaper, echoes the view of other owners when he says that recalcitrant governments do respond to an international body’s rulings. “We have achieved some successes,” Marroquín says. One notable example: the commission got the Guatemalan government in 2001 to recognize that it had failed to take steps to prevent the 1980 murder of journalist Irma Flaquer, and then failed to carry out a proper homicide investigation afterward. The family won $150,000 in reparations. Trotti says the Flaquer case led to the creation of a special prosecutor’s office in Guatemala to handle crime against journalists. In Brazil, a favorable ruling last year in the 1998 slaying of newspaper editor Manoel Leal de Oliveira could lead authorities to reopen his case, says Clarinha Glock, the IAPA’s investigator in Brazil. But winning justice in cold cases is notoriously difficult; the commission has admitted 11 of the 27 cases submitted by the IAPA since 1997 and issued favorable rulings so far in only three. María Idalia Gómez is sitting at her living room table in Mexico City and discussing the growing impunity problem in Mexico. The IAPA’s Rapid Response coordinator in Mexico, Gómez stops to read a newly arrived Blackberry message. “They have freed the final two journalists,” Gómez says. In a case riveting Mexico City’s press, drug traffickers had kidnapped four reporters near the northern city of Torreón, including cameramen from Televisa and Milenio, two of Mexico’s big TV networks. This act marked the first time that the targeted reporters worked for the networks, and their huge spotlight had turned it into a splashy story. To the consternation of Trotti and everyone else in the IAPA who has tried to address the impunity problem in Mexico, the Calderón government hasn’t made protecting journalists a priority, as have governments in Brazil and Colombia. Nor has the Mexican media, riven by disunity and a weak press association. All of these elements conspired last year against the IAPA when the organization tried to give Mexican journalists, media executives and government officials the benefit of what Colombia has learned. In many ways, Mexico seems to be where Colombia was in about 1985. The IAPA brought three well-placed Colombians to Mexico to tell their story. They were former President César Gaviria, Enrique Santos and Oscar Naranjo, the current head of the National Police. 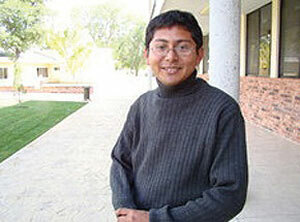 Gómez is the IAPA’s point person in Mexico for combating the uphill challenge there. Since being hired in 2003, Gómez, 39, has traveled the country documenting the facts of unsolved cases and providing news on the latest slaying. This work frequently puts her in the conflict zones. “The work is overwhelming,” says Gómez, who is often assisted by her husband, Darío Fritz. A fellow journalist, he works half-time for the IAPA. Most of the murders she investigates occurred outside Mexico City, in northern cities such as Tijuana where drug dealers have turned the former tourist destination into a killing zone. The Arellano Félix drug cartel and others muscled in, leaving hundreds dead in their wake. Death has become increasingly swift and brutal. Those killed for talking too much are found with their tongues cut off. Those killed for sleeping with a narco’s woman are castrated. The message for beheaded victims is clear — a cold-blooded warning not to mess with the narcos. Héctor Félix Miranda messed with them. A 48-year-old passionate baseball fan, Félix Miranda was the well-liked copublisher of Zeta, a hard-hitting weekly newspaper in Tijuana. He named names when he wrote columns denouncing drug trafficking, murders, torture and official corruption. Félix Miranda was driving to work one morning in 1988 when a black Trans Am cut him off. A gunman emerged to pump two 12-gauge shotgun blasts at Félix Miranda, killing him instantly. Drug traffickers targeted Zeta again in 1997. 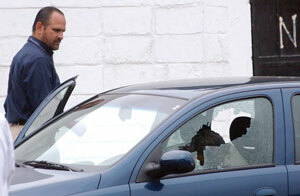 Gunmen badly wounded copublisher Jesús Blancornelas in an attack that killed his bodyguard. 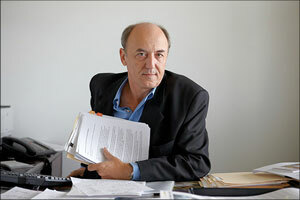 In 2004, Ricardo Trotti visited Tijuana to help Zeta coeditor Francisco Ortiz Franco gather more facts for the Félix Miranda case before the Inter-American Commission on Human Rights. Ortiz Franco was a marked man himself for his exposes. 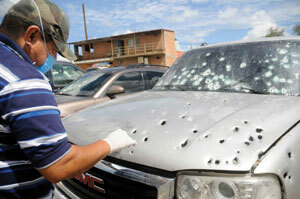 Three weeks later, a masked assassin targeted Ortiz Franco as he was about to drive to a doctor’s appointment. Two of his children were sitting in the car with him and watched him die. Two of Félix Miranda’s killers are in jail, but the mastermind was never punished. None of Ortiz Franco’s killers have faced justice. “We’re the news now,” explains Elia Baltazar, coeditor of El Excélsior newspaper and one of the march’s organizers. The violence that has left 61 journalists dead or presumed dead during the past five years — almost all in far-flung cities — is finally hitting home in Mexico City with the television journalists’ kidnapping. “The most important thing about the march is that it happened,” says Jorge Carrasco, who covers drug stories for Proceso, a hard-hitting news magazine. He decries the lack of solidarity until now. The first stirrings for change seem to present an opportunity for the IAPA to press harder to make a difference in Mexico. The group has had practically no success in recent years because of the official indifference in Mexico and the drug cartels’ power and ruthlessness. “It’s two steps forward and three steps backward,” says Ricardo Trotti. One encouraging sign: Calderón promised to push Mexico’s Congress to federalize crimes against freedom of expression, in a meeting with leaders of the IAPA and the Committee to Protect Journalists on Sept. 22 in Mexico City. Calderón also said he wanted Mexico to establish a system to protect journalists at risk, as Colombia has done. Many local government officials have pressured congress-men from their area to oppose the measure, Clouthier says, because “they operate hand-in-glove with criminal elements. Some help could be on the way: Trotti and other members of the Impunity Project met with Mexican billionaire Carlos Slim earlier this year to ask for his support. Slim, who owns a share of The New York Times, asked for a set of initiatives that he could fund. Editor’s note: This report was originally published on The Knight Foundation.